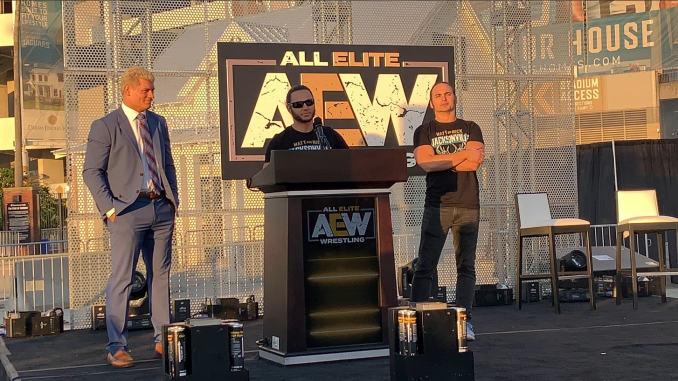 The new All Elite Wrestling promotion officially launched yesterday with their Double Or Nothing rally at TIAA Bank Field in Jacksonville, Florida. The biggest news coming out of the rally was the signing of future WWE Hall of Famer Chris Jericho, who closed the rally and announced that he is all in with AEW. Jericho said he’s with AEW because he believes in doing something new and something different, not for the money because he’s already got the money. AEW also announced that their Double Or Nothing event will take place on Saturday, May 25 in Las Vegas at the MGM Grand Garden Arena. They announced a second AEW event for Jacksonville to be held at a later date but details were not released. There were also no details on a possible TV deal or any kind of online distribution but more announcements will be made in the future. AEW Chief Brand Officer Brandi Rhodes spoke at the rally and confirmed the AEW women’s division, noting that they want this to be a strong division with the strongest women’s wrestlers in the world. Brandi said AEW cares about their female wrestlers and will be paying them equally with the male competitors. She said Cody agrees with her that there will be no sliding scale when it comes to pay. Regarding her role as CBO, Brandi said it will come with lots of hard work and long nights, but she is 100% committed to helping bring AEW to the level it’s supposed to be at, which she guaranteed. Regarding the Khan family, several of the speakers gave thanks to Tony Khan and his father, Shad Khan. We noted that the Khans confirmed their roles with the company. Matt Jackson noted during the rally that the Khan family approached them after All In last year and asked them if they really wanted to change the world, then offered to really help make that happen. It looks like AEW will be working with other promotions as well. Matt said they have come to an agreement with OWE (Oriental Wrestling Entertainment) in China, and that they will bring OWE into AEW to give them a major spotlight. Matt promised fans will love OWE if they’re not already familiar with them, praising the promotion for the “gifted” in-ring work they bring. It was also interesting that PAC (Neville) carried his Dragon Gate Open the Dream Gate Title when he came out for a confrontation with “Hangman” Page. The rally was trending on Twitter, before it even began. Hosts Conrad Thompson and Alex Marvez noted that more than 100,000 fans were watching the rally across the various platforms. I believe the YouTube stream peaked at around 60,000 live viewers. The rally featured pyro on the stage they used, and a larger fireworks display from inside the stadium, which is the home of the NFL’s Jacksonville Jaguars. The Jaguars mascot, Jaxson de Ville, and their cheerleaders were also featured. Below is the video of Cody with Gunn, along with various shots from the press conference and the full stream video.